Devotion to Our Lady of Divine Providence in our Congregation dates back to 1732 when the Roman people began to venerate her beautiful image in our Church of San Carlo ai Catinari. A few years later Pope Benedict XIV approved a special liturgy and the institution of a confraternity in her honor. From then on many Popes, from Pius VII to John Paul II, have shown their personal devotion to Our Lady of Divine Providence. In 1832 the pastor, Father Manini, founded a Religious Institute for women dedicated to her name. Father Semeria entrusted his Institute for war orphans to her protection. Today, love for Mary, Mother of Divine Providence, is a characteristic of the Barnabite family which, in every part of the world, dedicates churches, chapels, altars and houses to her honor. Day 1 - Refuge of sinners, pray for us. Day 2 - Consoler of the afflicted, pray for us. Day 3 - Help of Christians, pray for us. Devotion to Mary, Mother of Divine Providence began in the first house of the Congregation of the Clerics Regular of St. Paul (Bamabites) in Rome at San Carlo ai Catinari church around year 1611. The magnitude of the initial difficulties in financing the construction of the church, and later, the disastrous crumbling of the miraculous mural of the Blessed Virgin Mary, were unable to shatter the belief of Father Palma, the first pastor of the church, in the power of Mary's providential assistance. In 1663, the Barnabites were offered a remarkable painting of the Blessed Mother holding the Infant Jesus in her arms by the artist Scipione Pulzone (ca. 1550-1598). It was before her image that the Bamabite Fathers used to gather for their daily prayers. Public devotion to Mary, Mother of Divine Providence, did not begin until much later. In July 1732, an exact copy of the original painting was placed in a location adjacent to the main altar of the church of San Carlo ai Catinari with the inscription above, Mater Divinae Providentiae. The exposition of the painting for public veneration resulted in a great increase of devotion among the faithful. Numerous graces and favors were obtained through the intercession of Mary. This Marian chapel was a particular favorite of many Supreme Pontiffs. Pope Benedict XIV made an annual visit to the chapel. On February 2, 1815, Pope Pius VII in acknowledging that he owed his return to the Eternal City to the protection of Mary, visited the chapel and declared the altar perpetually privileged. Pope Pius IX spent the first years of his priestly life near the chapel of Mary, Mother of Divine Providence. More than once, he celebrated Holy Mass at the altar, offering to Mary the chasuble he wore on the day of the proclamation of the dogma of the Immaculate Conception in 1854, which still remains in the church. In 1888, Pope Leo XIII ordered the solemn crowning of the "Miraculous Lady" and approved the Mass and Office of Mary, Mother of Divine Providence. Saint Pius X showed his devotion to the Madonna of San Carlo ai Catinari by granting permission for the Votive Mass of Mary, Mother of Divine Providence on all Saturdays of the year. He also approved her scapular. This is only a glimpse of the living history of the miraculous image of Mary, Mother of Divine Providence. Today, the love for Mary, Mother of Divine Providence, is spreading throughout the world. Churches, chapels, altars and houses are dedicated to her honor. Virgin Mary, Immaculate Mother of Divine Providence, protect our life and sanctify us with the gift of grace. Obtain for us from the Father of mercy and the God of consolation pardon for our sins, reconciliation with our brothers and sisters, and comfort in the midst of afflictions. Renew our hearts that they may be come worthy dwelling places of your Divine Son, Jesus.Help us in our struggles against mediocrity, self-seeking, and pride so we can generously serve our neighbor. We entrust ourselves to you, o Mary, in our pilgrimage in this world. We invoke you as our guide and our defense against dangers. In the present tribulations, give us secure refuge. O sweet Mother of Divine Providence, turn your eyes to ward us, you who are our hope on earth. Grant that we may have you as our Mother in the glory of heaven. LEADER: Let us make our prayer of supplication to Our Lady, Mother of Divine Providence, that she, who is the Refuge of sinners, the Consoler of the afflicted, and the Help of Christians may kindly assist us in all our spiritual and temporal needs. ALL: Mary, Mother of Divine Providence, to us is justly due the title of sinners. To you is due the title of Refuge of sinners. You are the Mother of Mercy. Your heart is full of goodness and understanding toward your children who are in trouble and who seek your maternal help. We humbly ask you to help us open our hearts, that we may see our faults, be truly sorry for them, want to sin no more, and earnestly walk in the path of conversion. Hail, Mary, full of grace ... Refuge of sinners, pray for us. LEADER: Let us pray: O God, who in your providence dispose of everything according to your plan of love, through the intercession of the Virgin Mary, Mother of Your Son, keep us away from every evil and grant us what we truly need. Through Christ our Lord. ALL: ... Have mercy on us. (repeated after each invocation below). Providence of God, faithful guide in time of danger. ..
Providence of God, sustainer of the poor. ..
ALL: And we obey your decrees. ALL: O Lord, Good and Omnipotent Father, with your Providence, guide and protect us at every moment of our life. Teach us to be always obedient to your will so that one day, united to you in the glory of your Kingdom, we may praise and thank you without end. Through Christ our Lord, who lives with You and the Holy Spirit for ever and ever. Amen. Virgin Mary, Immaculate Mother of Divine Providence, protect our life and sanctify us with the gift of grace. Obtain for us from the Father of mercy and the God of consolation pardon for our sins, reconciliation with our brothers and sisters, and comfort in the midst of afflictions. Renew our hearts that they may be­come worthy dwelling places of your Divine Son, Jesus. Help us in our struggles against mediocrity, self-seeking, and pride so we can generously serve our neighbor. We entrust ourselves to you, 0 Mary, in our pilgrimage in this world. We invoke you as our guide and our defense against dangers. In the present tribulations, give us secure refuge. 0 sweet Mother of Divine Providence, turn your eyes to­ward us, you who are our hope on earth. Grant that we may have you as our Mother in the glory of heaven. Amen. ALL: Most loving Mother, proclaimed by the Church Consoler of the afflicted, nobody can understand our difficulties, our needs, our necessities, and our pains more than you do. You have been a fountain of consolation for the whole of humanity since the moment God promised us a Savior to redeem us. We beg you to look with loving understanding at our sufferings and our wounds, and to alleviate and heal them with the tenderness that only you, Mother, can give. Hail, Mary, full of grace .. Consoler of the afflicted, pray for us. ALL: 0 Lord, Good and Omnipotent Father, with your Providence, guide and protect us at every moment of our life. Teach us to be always obedient to your will so that one day, united to you in the glory of your Kingdom, we may praise and thank you without end. Through Christ our Lord, who lives with You and the Holy Spirit for ever and ever. Amen. ALL: O Immaculate Virgin, Mother of Divine Providence, you have been made by God Help of Christians, to intervene with your motherly care in every need and necessity of your children. The whole Christian world comes to you to implore you. The suffering in their afflictions, the dubious in their uncertainties, the weak in their work the exiles in their instability, the elderly in their solitude, the young in their search for truth, the dying at the moment of death, turn to you. We, too, at this moment turn to you, 0 Mother, and with trust we place ourselves under your protection. We ask you to free us from all dangers and evil, to help us advance in doing good, and to live in love according to the wishes of your Son Jesus. Hail, Mary, full of grace ... Help of Christians, pray for us. Providence of God, giver of graces. " Our Blessed Mother has so many beautiful titles, mostly created by the simple and spontaneous piety of the Christian people inspired by the loving theology called "sensus fidei." These titles are warm with affection and redolent with genuine goodness. They are poetic, luminous and warm. They express a truth and they express it effectively. A whole Marian theology is contained in them. By repeating them, ideas and loving feelings are intensified. Our title places us squarely at the centerof true theology. Mother: here is the synthesis of Mary's greatness. She is Our Lady because she was a mother. Mother of Jesus Christ! This says it all. It is the very root of Our Lady's "human" greatness. A woman achieves natural fulfillment by becoming a mother. Mother is the most august title of and for a woman. Even a queen is not happy if she is not a mother; and a mother has in her maternity the secret of a joy and a pride which a queen does not know. A mother is blessed among women, as Mary is blessed among mothers. 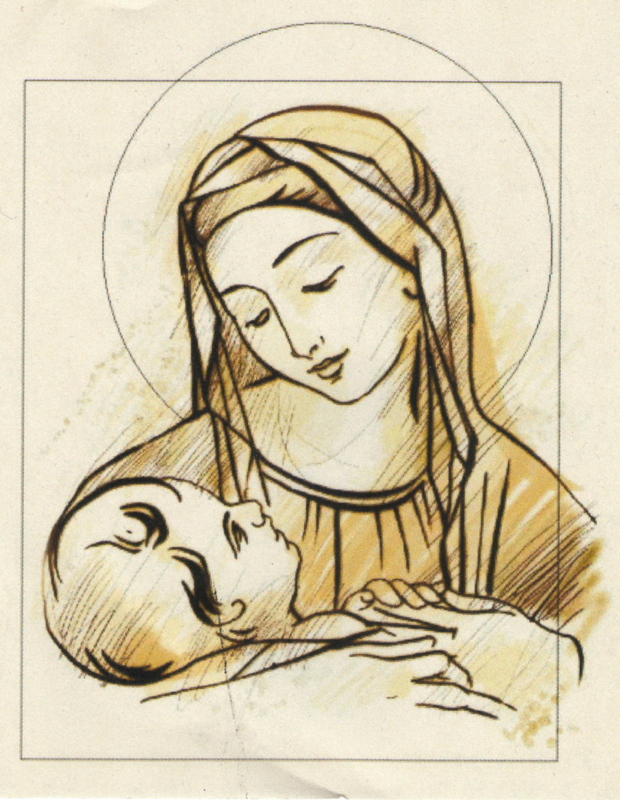 That name of mother expresses the "divine" greatness of Our Lady. She is higher than all other creatures, because she is mother of Jesus, Son of Man, and Son of God. The divine greatness of the Son is reflected on His mother. Among mothers she is the blessed one; she is the blessed one because the fruit of her womb is called Jesus, it is Jesus Christ. 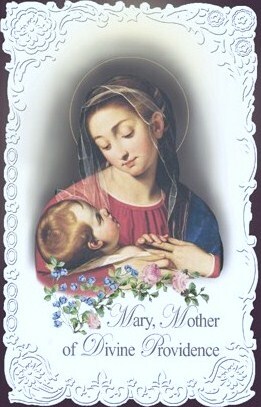 Mary, mother of us all; in Jesus, universal mother, because she is a unique mother. Jesus' love, action and sacrifice flood the world and the centuries, reaching to the ends of the earth, losing themselves in eternity. And where we find the widening effects of Jesus' love, there we find the widening effects of Mary's love as well. 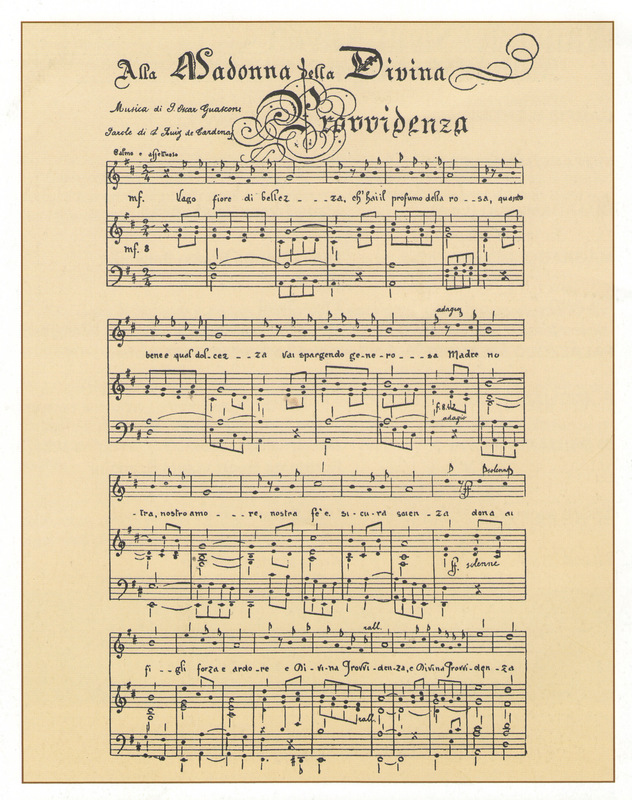 But this title, this condensed lyrical poem goes on: of Divine Providence. Here Mary is placed in direct relationship with the Dogma of God's Providence and, through this relationship, we are led to a most basic Dogma which Christianity shares with the most rudimentary forms of religion. Indeed whoever comes close, whoever simply desires to come close to God, to take the smallest step toward God, must believe not only that he exists, but also that he gives equal reward for human works, that he is the "provider" in the most basic and highest meaning of the word (cf. Hebrews 11:6). If there are no bridges between heaven and earth, does it matter if heaven exists or not, does it matter to us? This is why St. Paul proclaims that for our religious life the bare cold idea of a God does not suffice. God exists! So? What we need is the warmer, more luminous and more beneficial notion of a God who is provident. Who thinks of us, who is concerned about us. Christianity, a warm, alive religion; Christianity, the full revelation of God, starts here and somehow is all contained here. Because once Providence, God's Providence, is accepted the rest follows, with an easy and marvelous logic of its own. Everything in Christianity is absurd, everything would be absurd, if we were to deny or forget this great dogma of God's Providence. Everything is easy if that dogma is joyfully accepted. Our entire concrete existence depends on it. Surely, Christian life is prayer; but one cannot pray to a God who is deaf by nature and impervious to our petitions. Christian faith calls for ordering our whole life toward a divinely established goal, or, to put it more simply, it calls for obedience to God. Now, we can really obey only a God who summons us in love. Also, Christian life is mainly resignation to suffering, but we cannot be resigned to suffering unless it comes from the hands of a provident and loving father. Mary, Mother of Divine Providence, by her beautiful name and sweet title, leads us back to this authentic and wholesome Sacred Kernel of Christianity. Sweetly and relentlessly she introduces us into this atmosphere which we need to breathe in order to enjoy Christian vigor and strength. The Mother leads us to the Father.